Yarn Type The natural next step from our popular Summerlite 4ply. Beautifully soft and light to wear, made with finest Giza cotton this yarn is soft and tactile with a unique matt look. This yarn is ideal for delicate summer knits and great for crochet. Machine washable at 40 C.
12 designs by Marie Wallin for women using Summerlite DK. Inspired by the lush, green rolling landscape and traditional stone buildings of the English countryside. This brochure features easy, relaxed yet elegant knits designed to compliment your favourite pair of trousers, skirt or summer dress. 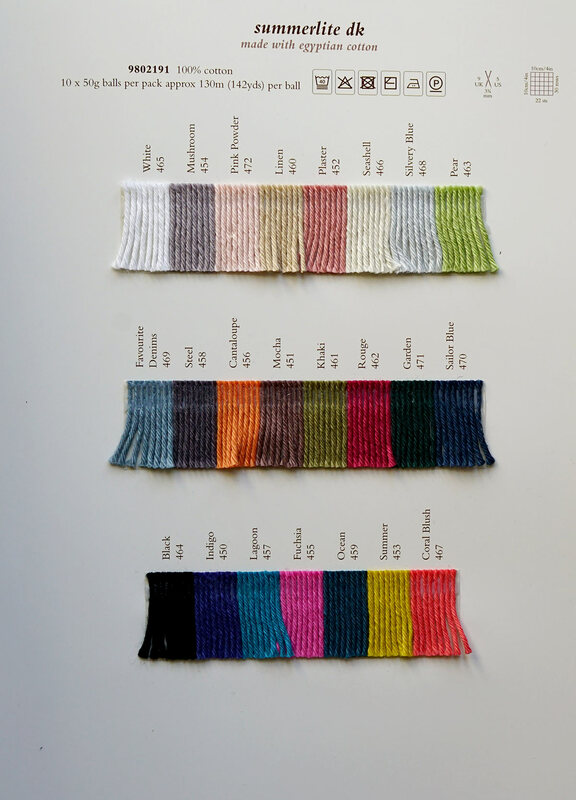 All knitted in a muted, yet fresh and light palette of summer colours. A range of very easy to intermediate knit designs Knitting Techniques used - Simple to knit textures, lace and eyelet techniques together with more intermediate-level slip stitch and cable techniques.